"What a lovely, lovely day"
In a world plagued by teenage dystopian cannon fodder, such as The Hunger Games and Divergent, Max Rockatansky has come to save us from this plague. It has been thirty years since we have seen Mad Max leaving Bartertown and the Thunderdome. Now, Warner Bros., in association with Village Roadshow Pictures, brings the road warrior back to the silver screen. Taking place 45-50 years after an apocalyptic event has destroyed earth, small factions of tribes and people still roam the earth in search of basic necessities — water, food, gasoline, procreation. Enter Max Rockatansky, a road warrior, who after the loss of his family has taken to become a scavenger, living on the dusty roads of this new earth, surviving the best he can and when his conscience gets the better of him, helping out others too helpless to help themselves. Mad Max: Fury Road has had quite a long and bumpy ride to being made. It took no less than 15 years for this masterpiece to finally be shown to audiences. It all started back in around 2000 when 20th Century Fox and original Max star Mel Gibson (Lethal Weapon, Braveheart) were interested in making the fourth film, but 9/11 happened and the budget, as well as the film, collapsed. By the time it was back on track again, this time at Max's home studio, Gibson was now blackballed from most Hollywood productions, and a new star and more up-to-date film had to be created from scratch. Enter a new cast that really enhances the experience of the film. Max, now played by Tom Hardy (Batman: The Dark Knight Rises, Inception), easily fills the shoes left vacant by Gibson adding depth and emotion to the role of Max Rockatansky. To compliment Max in the waste land, we are also given a female road warrior, this time in the form of Imperator Furiosa played by the beautiful Charlize Theron (Prometheus,Devil's Advocate) who completely throws herself into character by going bald for the part. Rounding out the cast are familiar faces in apocalyptic films, Zoë Kravitz (Insurgent), Rosie Huntington-Whiteley (Transformers: The Dark side of the Moon), Hugh Keays-Byrne (Max Max), and a surprisingly great performance by Nicholas Hoult (X-Men: Days of Future Past). Medical doctor turned writer/director George Miller (Witches of Eastwick, Happy Feet) goes all out on this fourth installment in the Mad Max series. It seems at 70 years old George Miller is finally at the top of his game. 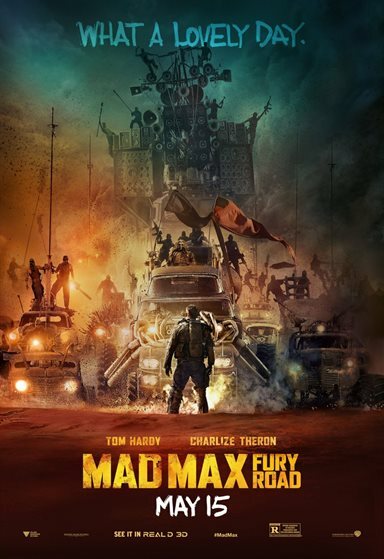 Never before have the action scenes been more engaging, the cinematography and color-depth of the wastelands so glorious, and characters more appealing than in this Mad Max film. One of the most amazing feats that Mad Max: Fury Road accomplishes for its audience is the fact that there is almost no CGI used in the film. All of the breathtaking stunts you see on screen are real stunt people performing them. CGI was used a bit to remove some of the grips and wires from the film, but other than that (now kids, pay attention) the actors and crew performed these death-deifying feats all for your entertainment. These stunts were so jaw-dropping that even director Robert Rodriguez shockingly asked Director George Miller, "How the hell did you film that!?" during this year's SXSW festival. Mad Max films are known to affect us on a visceral subconscious level that half the time we do not even know is happening. Mad Max: Fury Road is no exception to that rule; in fact, it actually enhances it. While audience members are struggling to catch their breath from all of the action around them, unknown to them, these chaotic scenes are actually a beautiful symphony. One of the most surprising elements that rounds out the film is the soundtrack by Tom Holkenborg aka Junkie XL. The sound is very hypnotic and exactly what you would expect warriors to be listening to while going to battle in this type of film. Miller even went as far as incorporating an electric guitar into the film that spits fire into the air and accompanies the soundtrack. Download Mad Max: Fury Road from the iTunes Store in Digial HD. For more information about Mad Max: Fury Road visit the FlickDirect Movie Database.